Biratnagar– Deputy Prime Minister and Minister for Defence, Ishwar Pokhrel, has said the army will be mobilized through a decision of a meeting of the National Security Council alone. 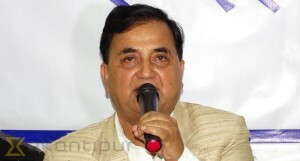 Talking briefly to journalists at Biratnagar airport today, he said the army would be mobilized after the President approves a proposal for the same brought by the Prime Minister in the capacity of the Chair of the Council and endorsed by the meeting of the Council of Ministers, in the case the Council's meeting cannot take place. Stating that such proposal has to be approved by the House of Representatives a month after the army mobilization, Defence Minister Pokhrel said it was wrong to say that the army mobilization takes place only through Prime Minister's lone decision. He said talks would be held with the Biplav group only if it abandoned arms and came for dialogue. "Talks cannot be held with the group raising arms," he insisted. The DPM added that the group had to be banned as it carried out bombings, involved in violence and killings and spreading terror among the people. He said the government has no enmity with the CPN Chand group, except against its violent and terrorist activities. In reply to a question, he said the government has heard that the main opposition party has urged for withdrawing the bill. Noting that there were procedures, laws and mechanisms to control corruption at the local level, he said the government would soon formulate the laws if any were required. The Defence Minister stated that the confusions regarding the order of precedence could be corrected if any proposal was received to that connection.